Requirements were REVISED effective on January 1, 2017. However, the requirements became available when a new merit badge pamphlet was issued in 2016. Describe the top 10 mistakes new drivers frequently make. Name the two items you are required by law to carry with you whenever you operate a motor vehicle. Describe how alcohol and other drugs affect the human body and why a person should never drink and drive, or drive while under the influence of any mind-altering substances, including prescription drugs, cold medications, and illicit drugs. For the state where you live, find out what is the legal blood alcohol concentration and the consequences for driving while intoxicated or driving under the influence. Find out what the open-container law is in your state. Describe at least four factors to be considered in the design of a road or highway. Explain how roadside hazards and road conditions contribute to the occurrence and seriousness of traffic crashes. Explain why a driver who is fatigued or distracted should not operate a motor vehicle. List five common distractions, explain how driver distractions contribute to traffic accidents, and tell how drivers can minimize distractions. Describe how volunteer drivers can plan to be alert when transporting Scouting participants. Demonstrate how to properly wear a lap or shoulder belt . Explain why it is important for drivers and passengers to wear safety belts at all times. List five safety features found in motor vehicles besides occupant restraint systems. Describe each safety feature, how each works, and how each contributes to safety. Using your family car or another vehicle, demonstrate that all lights and lighting systems in the vehicle are working. Describe the function and explain why each type of light is important to safe driving. Using your family car or another vehicle, demonstrate how to check tire pressure and identify the correct tire pressure for the vehicle. Explain why proper tire pressure is important to safe driving. Demonstrate a method to check for adequate tire tread. Explain why proper tire tread is important to safe driving. Demonstrate with a smear-and-clear test if the windshield wiper blades will clear the windshield completely or need to be replaced. Describe instances in good and bad weather when windshield washers are important to safe driving. In a location away from traffic hazards, measure with a tape measure - not in a car - and mark off with stakes the distance that a car will travel during the time needed for decision and reaction, and the braking distances necessary to stop a car traveling 30, 50, and 70 miles per hour on dry, level pavement. Discuss how environmental factors such as bad weather and road conditions will affect the distance. Describe the difference in nighttime visibility between a properly lit bicycle and rider (or a pedestrian) wearing reflective material and a bicycle and rider with no lights (or a pedestrian) dressed in dark clothing, without reflective material. Explain how color and shape are used to help road users recognize and understand the information presented on traffic and roadway signs. Explain the purpose of different types of signs, signals, and pavement markings. Describe at least three examples of traffic laws that apply to drivers of motor vehicles and that bicyclists must also obey. 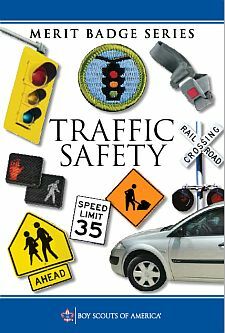 Interview a traffic law enforcement officer in your community to identify what three traffic safety problems the officer is most concerned about. Discuss with your merit badge counselor possible ways to solve one of those problems. Using the Internet (with your parent's permission), visit five websites that cover safe driving for teenagers. Then, in a group session with at least three teenagers and your counselor, discuss what you have learned. Initiate and organize an activity or event to demonstrate the importance of traffic safety. Accompanied by an adult and a buddy, pick a safe place to observe traffic at a controlled intersection (traffic signal or stop sign) on three separate days and at three different times of the day, for 30 minutes on each visit. At this intersection, survey violations that might occur. These violations could include (but are not limited to) running a red light or stop sign, speeding, using a cell phone while driving, or occupants not wearing their seat belts. Count the number of violations. Record in general terms the approximate age of the people you observed. Keep track of the total number of vehicles observed so that you can determine the percentage of compliance vs. violations. Discuss your findings with your merit badge counselor. As noted above, a new merit badge pamphlet with revised requirements was issued in 2016, after the release of Boy Scout Requirements 2016. There was a minor change to requirement 4b and revisions to requirements 5b and 5d. The text in Boy Scout Requirements 2017 includes the change to requirement 4b, but inadvertently does not include the changes to 5b and 5d. The text above shows the wording of requirements 5b and 5d as it appears in the merit badge pamphlet, rather than the wording in Boy Scout Requirements 2017.